Davis says desire for a multiyear contract won't consume as he prepares to open the season in Japan next month against the Seattle Mariners. He hopes to dazzle Japanese fans by hitting at least one home run. "Whatever works best for the organization," Davis told The Associated Press on Sunday. "For me personally, I just want to focus on this year. I don't like to get ahead of myself or look back in the past and play in the past. I just try to focus on the now. Whatever comes long-term is going to come. If they want me here long-term they're going to get something done." Oakland general manager David Forst has said signing Davis long-term is a top priority. The team spent the off-season putting pieces around the star outfielder and designated hitter to try to build another consistent contender. 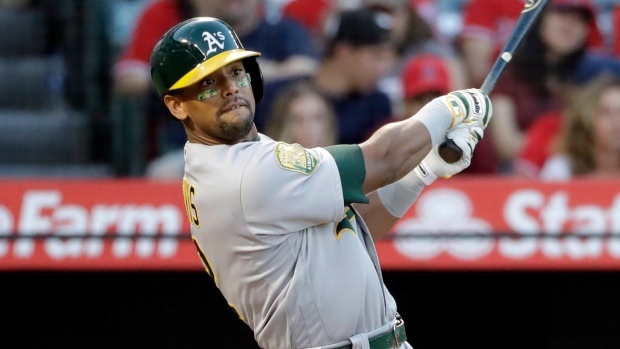 Led by Davis' 48 home runs and career-high 123 RBIs, the 97-win A's returned to the playoffs for the first time in four years before losing the AL wild card game to the New York Yankees. The slugger joked about the fact he has hit .247 for each of the past four seasons. He received a $6 million raise this off-season to $16.5 million. "I'd like to be here. I hope something gets done," Davis said. "It's not a good thing being a free agent right now. For my security, it's going to impact a lot. That's the way the business is. I'm already 31 so I don't know if I'm too old. There's a lot of things that run through my head. Who knows. If it happens, it happens." Manager Bob Melvin had some encouraging things to say in Saturday's team meeting, and Davis said "it made me feel a little more secure." "Shoot, I want to stay here at least three more years, but that's a long time to be an Oakland A. But if anybody can do it, I guess it's me, hopefully," Davis said. "I don't think they'll trade me as long as we're doing good. So we better do good so I don't get traded." "He's been as good a fit here as some of the great players in the past here," Melvin said. "I kind of alluded since the day he got here he seems like the perfect fit for our city, for our team, the attitude he has as a superstar that has an everyday workmanlike mentality, doesn't want the spotlight, so that's kind of what I was implying. I mean what I said, he's been absolutely terrific for us." Davis and Jimmie Foxx from 1932-34 are the only players in Athletics history with three straight 40-homer seasons. Davis hit 85 homers in 2017 and '18, second in than span to Giancarlo Stanton's 86. "Now I'm kind of like over it," he said. Davis stuck with his regular off-season routine and has determined certain numbers he would like to reach this season. "Why would I change anything up? Come on, I'm at the top of my game right now. I wouldn't change that up," he said, noting of the high expectations: "It's a great thing. I like it. I did it to myself. I'm the only one that can hit .247 for four years. I pretty much have that force field around me." "My concern would be that we're down to the last year with him and the potential of losing him would come up next year," Melvin said, "and I hope that's not the case."